disappearing on mysterious "errands"; she speaks many languages--not all of them human; and her bright blue hair actually grows out of her head that color. Who is she? That is the question that haunts her, and she's about to find out. When this book first came out, I heard nothing but rave reviews and I was keen to read it. After finally buying a copy the other week, I actually saw some less positive comments, but I was still interested to see what it would be like. I must say that I agree with the positive reviews. Karou is a fabulous character, flawed and yet endearing, and I was immediately caught up in her story. The premise of the piece was original and interesting and the plot flowed at a good pace, featuring plenty of action, excitement and nail-biting. I liked Taylor's writing style, in particular the way she expressed the characters, and I appreciated the fact there was an instant connection between hero and heroine without resorting to droopy-eyed love at first sight. I was on the edge of my seat by the end and I am certainly looking forward to finding out what will happen to Karou in book two later this year. 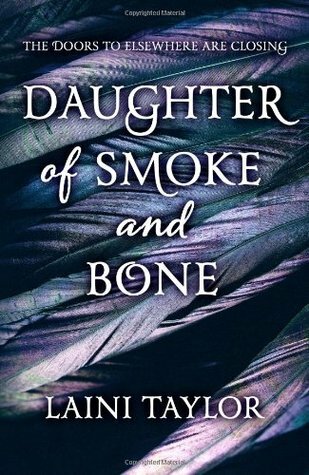 This is a great YA paranormal/fantasy story and I can highly recommend it to other readers. I agree, I haven't written up my review for this one yet, but I really enjoyed it. The writing was beautiful, and the world building was amazing. I haven't gotten lost in the setting of a book in a long time... but this one had me imagining cobblestone streets, shadowy back alleys, war torn landscapes and otherworldy cities. Amazing! I just love this book!!! I think it is a great fantasy story and I just can't wait for the next one in the series!! !